Gerry Downing, a revolutionary socialist expelled by Labour after criticism of his views on 9/11, has said he will appeal against the move. David Cameron called on Labour leader Jeremy Corbyn to expel him from the party at Prime Minister's Questions. Labour's ruling NEC later said it had excluded him after "further evidence" had come to light about him. 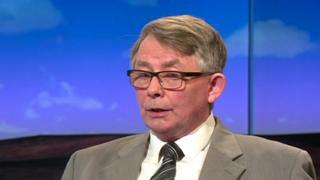 Mr Downing said his views on 9/11 and so-called Islamic State had been quoted out of context. In the Commons on Wednesday, David Cameron quoted a blog by Mr Downing, which said the 9/11 hijackers "must never be condemned". Mr Downing insisted he had been explaining the motivation of the 9/11 attackers, "not agreeing with what they were doing", adding: "I don't support the politics of Isis, they are vile barbarians. But I don't support American imperialist bombing either." Mr Downing, a former bus driver and member of the tiny Socialist Fight group, told the Daily Politics: "The ambition to overthrow capitalism is a very legitimate political ambition." He was expelled by the Labour Party last August over views expressed on his Twitter feed and blog but was re-instated in November after an appeal. Mr Downing said he "had been" a Labour member until Wednesday night, "but nobody bothered to inform" him that he'd been excluded. He told the Daily Politics the party "should be welcoming" to people with his views and he planned to seek re-admittance. "If it allows UKIP councillors who defect and it allows people from the far right, and people of that nature, I cannot see why it should not allow in people like me." Asked by presenter Andrew Neil whether he would condemn the 9/11 attackers, Mr Downing said he wouldn't use the word "condemn", saying he would seek to "understand the motivation of the people that did that." Mr Downing said his group does not support so-called Islamic State "militarily or politically" but he does believe in providing "tactical" support, which he explained as being against US bombing. He said he was not a "personal friend" of John McDonnell but said the shadow chancellor had "secured some justice for me" in a work dispute, after the two men met on the Labour Representation Committee. Times journalist Philip Collins, a former speech writer to Tony Blair, said he was "delighted" Mr Downing had been expelled, telling him there was "no place in the Labour Party for your views". In an open letter to Mr Corbyn, before Mr Downing's latest expulsion, Labour MP John Woodcock, a longstanding critic of the Labour leader, said his group's views were "sickening and bring our party into disrepute". In a statement of its aims on its website, Socialist Fight says: "We defend the 'Islamic State' in Syria and Iraq against the bombing of US imperialism but do not ally with them against the Kurdish defenders of Kobane and Rojava (Western Kurdistan)." The post goes on to explain its stance in some detail. saying, among things, that "the Islamic State is a reactionary utopia and has no legitimate right to self-determination".